Since Google’s blogger platform for blogging is totally free, therefore you might see many people to begin their blogging journey with Blogger. Eventually later-on after learning the basics of blogging from Google’s Blogger platform, many of the successful bloggers shift towards WordPress platform since WordPress offers more flexibility and control over your blog and has many SEO based advantages in addition to high level of customization and premium themes availability. But the fact is it takes a bit of time for time to get yourself familiar with WordPress blog, since you were previously engaged with Blogger platform. 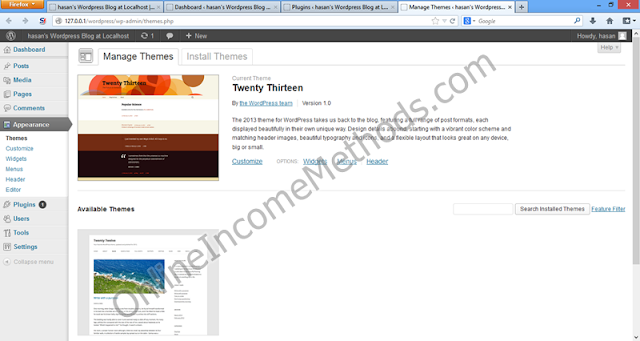 Even though WordPress.com offers free wordpress blog hosting, but still that lacks features such as plugins and premium themes. However having a full self hosted version of wordpress live at any web host, will cost you money and isn’t feasible unless you have the basic know how of wordpress. 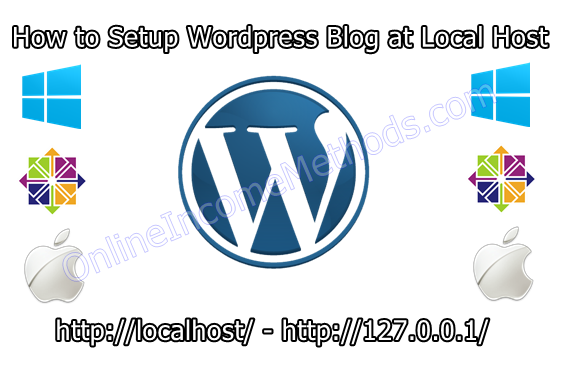 Today I will be sharing how bloggers can get started with self hosted WordPress version at Local Host using their own PC for learning purposes, later-on its quite easy to shift a local hosted wordpress blog to live wordpress blog at your favorite wordpress web hosting provider. 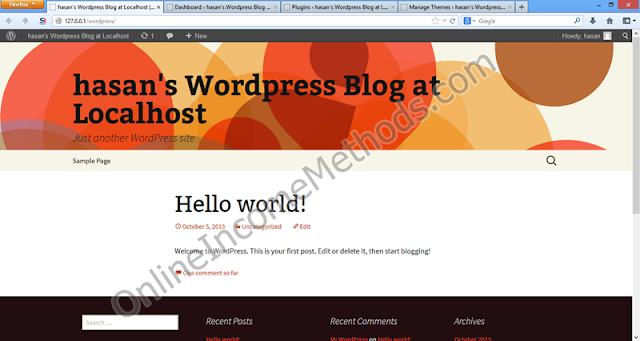 Since WordPress Self Hosted version requires a web server like Apache equipped with PHP and MySQL Database. 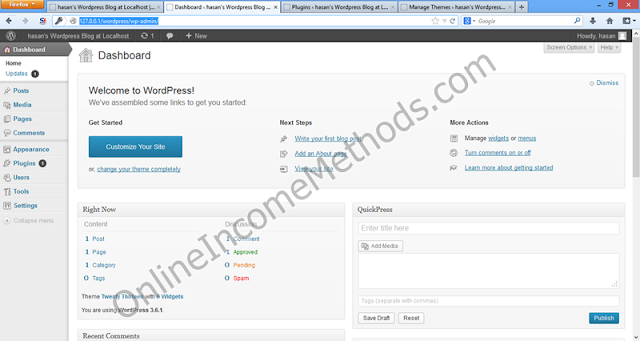 And PHPMyAdmin tool to manage MySQL based database for WordPress blog. You can download and configure each prerequisite manually, however that would be somehow ambiguous and time consuming process. 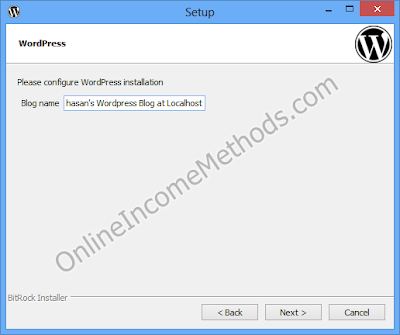 There are many variants of these all in one stacks in the form of XAMPP, WAMP, Microsoft’s Web Matrix and BitNami that ease up wordpress installation process at LocalHost. Each of these stacks are available for Windows, Linux and Mac OS X for Free, except for WebMatrix as its only available for Windows. 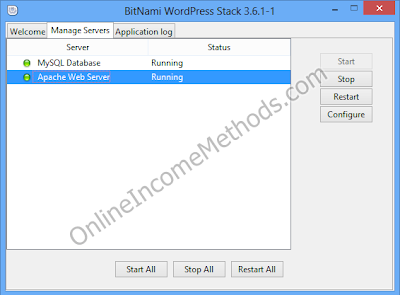 I would suggest you to go with BitNami Wordpress stack since its the most easiest way to setup a wordpress blog within your PC at localhost. 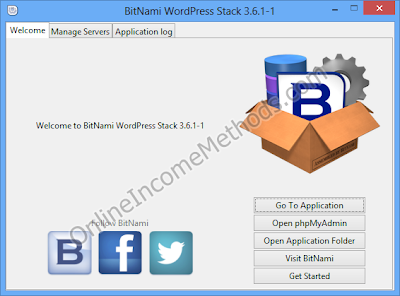 I would be demonstrating this tutorial using BitNami Wordpress Stack with Microsoft’s Windows 8. There won’t be any problem at all if you are using Linux or even Mac OS X. 2. Choose the BitNami wordpress stack installation directory and continue with next button. 3. 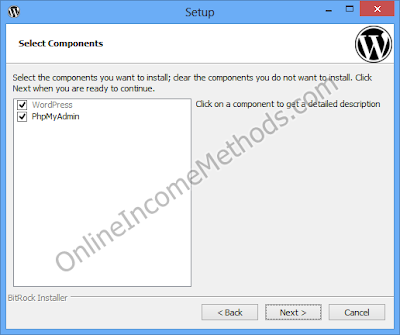 PhpMyAdmin is optional to be installed, however its highly recommended component that you should install it. Since it will help you manage and backup the MySQL database manually. 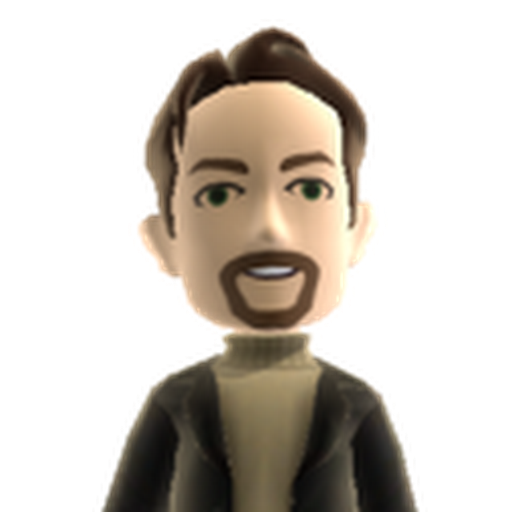 Select PhpMyAdmin and hit next. 4. Now enter your name, email address and new username / password details for your WordPress Blog. Same username and password combination can be used to access PhpMyAdmin, however it won’t let you access your wordpress database “bitnami_wordpress”. You have to use “root” as the username and same password to access your wordpress database from PhpMyAdmin. At next step it will ask you to configure SMTP mail client such as gmail or any other, you can either opt for it or skip that step. 5. Afterwards the setup will ask you to choose your blog’s title / name. And hit next. 6. 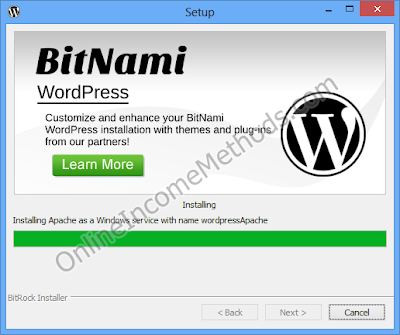 Wait for a while until your computer completes BitNami WordPress Stack installation. It will install Apache2 Web Server, PHP, PHPMyAdmin and WordPress in a directory that you had already chosen at first step. Most probably “C:BitNamiwordpress-version“. During the installation process you might see certain command prompts opening and closing automatically, that’s how Apache web server is being configured by the installation setup. After successful installation of BitNami WordPress Stack, your web browser will automatically open http://127.0.0.1/wordpress/ or http://localhost/wordpress/ and will show your newly installed wordpress blog at localhost over there. Now you can easily access the WordPress administration panel at http://localhost/wordpress/wp-admin with the username and password you had chosen during installation process. Apart from that you will also see a minimal control panel that lets you access Application Directories, PhpMyAdmin, Manager Servers and Application access logs. You can manually access this management control panel at C:BitNamiwordpress-versionmanager-windows.exe. You can also Manage MySQL Database & Apache Web Servers with this control panel, you can either start, stop or restart these servers in case of any error. If you are facing database connection error or page not found errors, probably you need to restart both of these servers. Please note that if you planning to make your wordpress blog live from the localhost version, this “httpd-app.conf” file has to be modified a bit to form a proper .htaccess file. In case you are looking forward to have your local host wordpress installation to be made live, you can hire me for this task. If you are facing any errors or ambiguity, you can surely leave your comments and I’ll be glad to help you out. In addition to that you can Claim FREE WordPress Installation & Optimization from us. Why WordPress (Self Hosted) is Better Than Blogger (BlogSpot)? 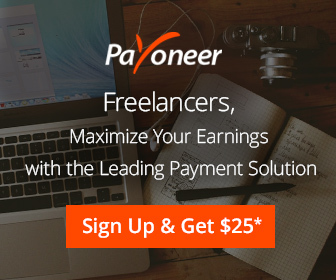 ← How to Make Money with HostGator Affiliate Program?